Happy Meal and I had just spent a glorious day at The Cove, a water park in Riverside, CA. A quick web search suggested that the one-year old Burger Boss was the best burger in Riverside, CA. Happy Meal and I needed to find out for ourselves. 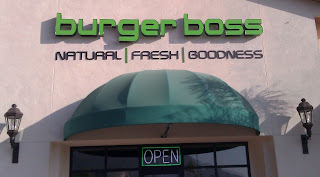 Burger Boss was located in a burgeoning strip mallish development (new construction) in an area that could best be described as retail/big box sprawl. Parking was free and convenient. Burger Boss had a Smashburger feel to it. Lots of polished stainless steel, tile, a clean and highly-customizable menu, and some fancy topping choices. We ordered a couple of burgers from the very enthusiastic gent at the register (the owner's son). Our cheeseburgers arrived at our table moments later. This was good, because we were hungry, and place smelled wonderfully of beefy goodness. The Beef: Happy Meal proclaimed that his burger was "super awesome." Frankly, I was in agreement--the beef was excellent. Each burger patty at Burger Boss was 6 ounces of 100% Black Angus Chuck. The fat content was about 20%, and that was just right. The burgers had just enough fat to barely coat the lips. There was a mild note of aged funk. The beef flavor boomed on the palate. The finish was interesting...the beef was coarsely ground (off-site), so at the end of each bite, one was left savoring the coarse strands of beef, and it had a satisfying steak flavor. The beef had a tenderness, which suggested that it had arrived freshly ground. The burgers at Burger Boss tasted a lot like the burgers at Super Duper Burger in San Francisco. Bear in mind that Super Duper Burger makes one of my favorite "fresh food fast" burgers. 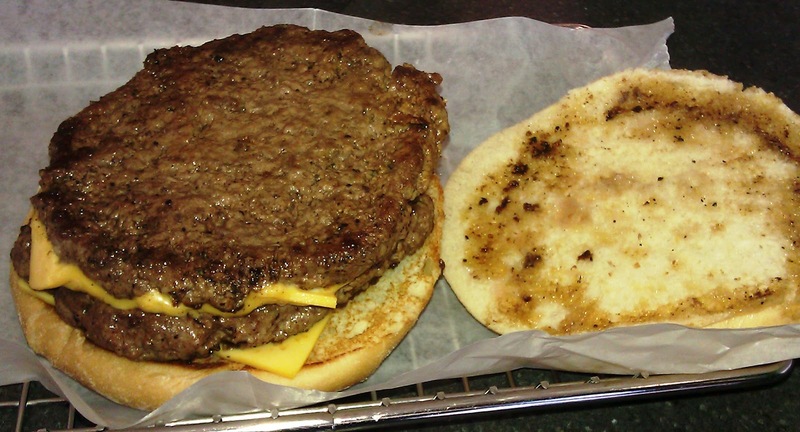 The Seasoning: Burger Boss liberally applied salt and pepper to the burger patties as they cooked on the flat-top. The salt and pepper really enhanced the inherent beefiness of the coarsely ground Chuck. The seasoning was dead on. The burgers were satisfyingly savory. Savory enough to handle a dab of ketchup or BBQ sauce. The Sear: The photos do not adequately document the competent sear that was present on the cheese-covered side of our burger patties. The sear was dark and crisp. It had the satisfying salt and crunch of bacon. The Preparation: At Burger Boss the default cooking temperature was Medium,. This was for good reason. Medium is just at the sweet spot where enough collagen melts to develop beefiness, but the proteins in the Chuck do not denature to the point where the whole works becomes chewy and dry. The burger patties were prepped during the day shift. 6-ounce balls of beef were formed and set aside. When it came time to cook them, the half-formed patties were pressed onto the griddle. This served to loosen up the texture and sever some of the freshly created protein bonds. 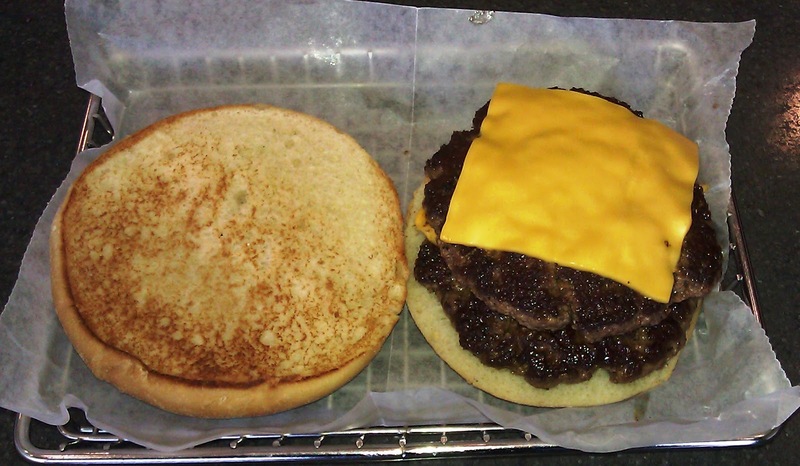 The cheese was placed atop the hot patties, and it melted after the patties were placed on the bun. I would encourage you to allow your cheeseburger to rest for a few moments as the cheese melts. The Cheese: Of the 7 cheese choices at Burger Boss, Happy Meal and I both went with the staid and pedestrian Yellow American. We will be more adventurous on our next visit...yes, there will be a next visit. The savory American cheese worked smoothly into the bite. It provided just the right touch of creaminess to really round things out. 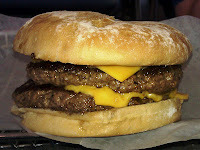 The Bun: The white bun option at Burger Boss was a potato Kaiser roll. This bun was sweet, fresh, moist, tender, and it compressed to create the ideal amount of chewiness to offset the tender beef and creamy cheese. The bun was not toasted, and this was fine. The crisp sear did all of the heavy lifting in the texture department. 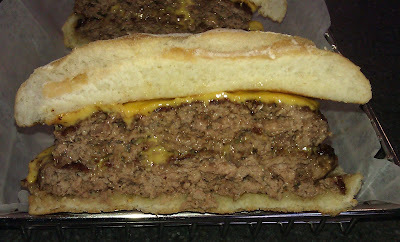 The Meat To Bun Ratio: This was one of those odd cases where the bun worked perfectly for both the single and the double cheeseburgers. 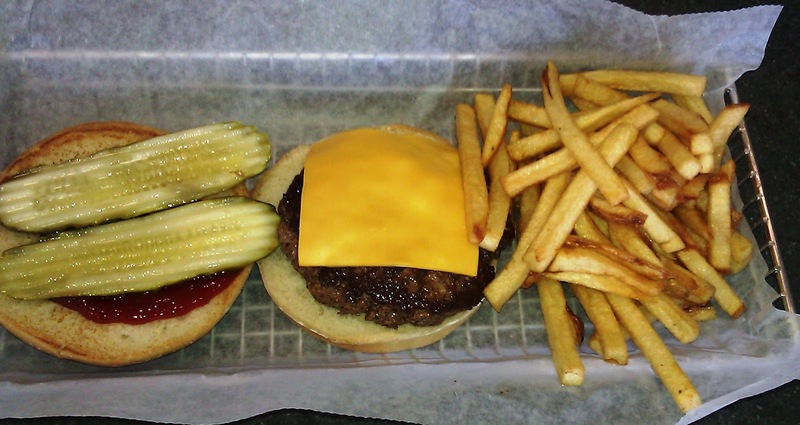 The Fries: Burger Boss cut their fries peel-on and in-house. The fries were par-cooked and finished in canola oil. They were then finished with sea salt. The fries were excellent--crisp, hot, flavorful, and golden brown. The Toppings: I couldn't find a topping that I didn't like. The Romaine lettuce was clean and fresh. The tomato slice was ripe, firm, and flavorful. The sauteed mushrooms were a delight. The chipotle BBQ sauce was no joke--it had a firm note of heat. The chipotle mayo was equally good, but with a lessened degree of kick. The long pickle slices were crisp and sour. The Value: Yer darn right! Happy Meal and I dropped about 17 bucks on a single cheeseburger, a double cheeseburger, a large beverage, and a side of fries. Each patty was 6 ounces, and couldn't finish my double cheeseburger. I left Burger Boss both saddened and relieved. I was saddened that it was a 45 minute drive from LA. I was happy, because Happy Meal and I had season passes to the The Cove water park, and we already had plans to return in two weeks. The Burger Boss surpassed both Smashburger and Five Guys Burgers and Fries. Burger Review : One of the best burgers in LA was in Riverside. Honestly, it was kind of worth the drive. The value pretty much offset the fuel costs. Can't wait to try this one after Fatburger closed down.